Online registrations are now closed. There will be $75 cash only registrations on the day from 8.00am to 9.20am. Book now and go in the draw to win a 4 night cruise. We look forward to seeing you at our event on the 25th March 2018. This event is proudly hosted by the Ballarat Triathlon Club and will cater for all entrants who have an interest and desire to swim the magnificent 1956 Olympic Rowing Course. 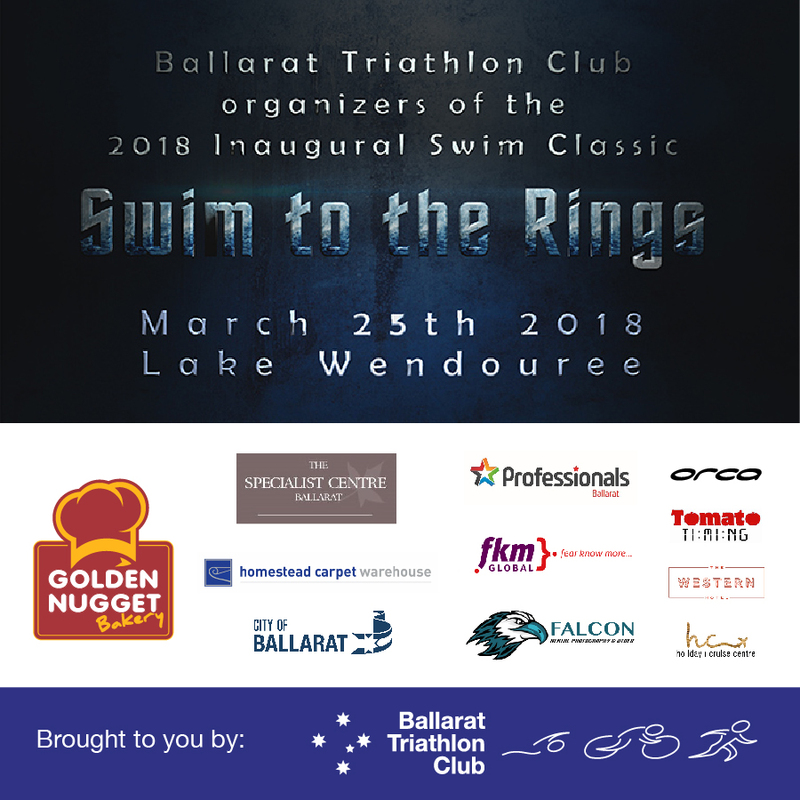 From the big guns that will swim it in under 20 minutes, to everyday swimmers that just enjoy a challenge, this is the event for you so come on down to Ballarat and dip your toes in the water and “Swim to the Rings”. Hot off the press is the news of a specific lane on the course allocated to swimmers who want to wear flippers!! Flipper swimmers understandably wont be in the running for age group categoriy prizes but will be able to participate in the event and enjoy the experience of swimming the iconic 1956 Olympic rowing course. The marquee "Swim to the Rings” event is a 2,000 m straight-line swim down the entire length of the 1956 Olympic Rowing Course. It will be a truly unique experience not to be missed! Event start time will be approximately 10.00 am. (Please note that the originally planned 500m "Splash & Dash" has been cancelled due to the overwhelming preference for the full 2,000m event, particularly now that flippers may be worn by those a little less confident). While not confirmed, imagine swimming this magnificent course with household name Olympian swimmers and celebrities! More to come on that a little further down the track. Please take advantage of discounted entry prices until 11th March and share this event amongst your friends and family. Then start ticking those arms over and get ready to be one of the swimmers on the starting line of the inaugural 2000 m "Swim to the Rings" on 25th March 2018. Can I use a wetsuit? Short answer...Yes. We realise that there are lots of swimmers out there that are comfortable in the pool but may like the added buoyancy and comfort in wearing a wetsuit, so 'Yep' is the answer. We'd suggest some practice in one prior to the day if possible though. Short answer...Yes. Orca Wetsuits will be available for rent on race day at a cost of $50. If you would like to rent a wetsuit, please get in touch with Orca Australia by sending an email to: info@orca-australia.com.au Wetsuits are subject to size availability, so make sure you get your order in early! Can I have a practice swim in Lake Wendouree prior to the event? Short answer...Yes. Whilst you cannot have a practice swim along the actual rowing course, there is a designated safe swim area also in Lake Wendouree. Entry & exit from St Aidand Drive / Wendouree Parade for approx 700m out and back loop with 4 buoys for sighting (these buoys currently have ‘no boating’) in a "L" shape. It is suggested that you swim with the buoys to the left of you approx 2-3 metres where the water is clear, clean & 98% weed free. Added bonus in this area is that most swimmers should be able to stand up. For anyone interested there is a loose swim schedule of 6pm Monday and Thursdays & 4pm Sundays (wetsuit optional), however there is no guarantee that a club member will be there . What are the age group categories? There will be medals for first, second and third in both the male and female 2,000m age group.